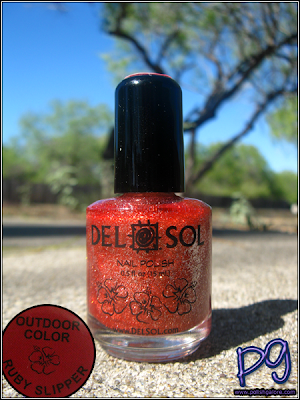 This is the polish that I've had my eye on ever since I heard of "color change" polish by Del Sol. Ruby Slipper is a silver glitter in a clear base when it's in the shade. To test this, I put CND Brilliant White for my pinky and ring finger, China Glaze City Siren for my middle finger and a bare nail for my index finger. Then I put 3 coats of Ruby Slipper over each finger. The only finger I sealed with top coat (Seche Vite) was my pinky. First let me show you what this color looks like when the sun hits it. Over white, Ruby Slipper had more of a pink effect because the clear base is actually a red color changing effect. Over red, it just looks silver glitter mixed in. On my index finger, first I see that I sucked at polishing and got it all over my cuticle. (Oops), but it did work pretty well. I think I like this best over a red. After being in the sun, all colors faded back to silver. I have this color and like it best over a Finger Paints Sparkle top coat, a light white frost. That way it's not totally boring by itself, but pretty red in the sun! 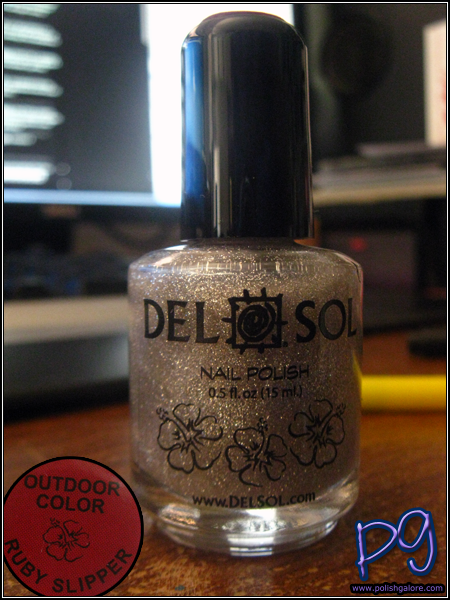 I have a few Del Sol polishes, and this is by far my favorite. It is such a dramatic change from indoors to outdoors. Love it!